5 years is a long time in the video world. Cameras come and go, technologies change, but for 5 years there has been one camera that has remained essentially unchanged and that’s the versatile and well regarded Sony EX1 and EX1R. 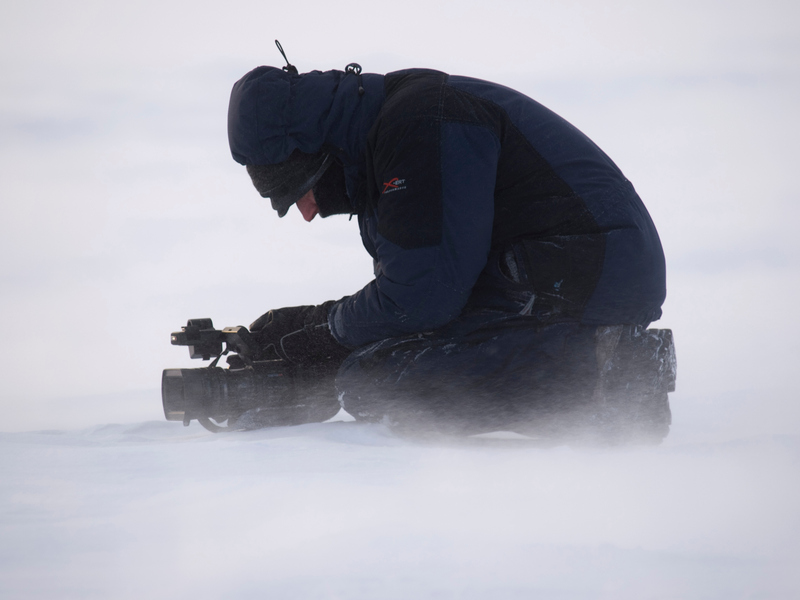 Alister shooting with an EX1 in the Arctic. 5 years ago I was asked by Sony to review a new handheld camcorder, that camcorder was the EX1. A camera that went on to change the way I work and the way many production companies work, because for the first time you had a handheld camera that could take on the bulky shoulder mounts in terms of picture quality. The EX1 was the first handheld camcorder to offer full resolution and low noise HD pictures thanks to it’s 3 half inch 1920 x 1080 sensors. Not only did it have great image quality but it also had a great lens with 3 separate rings for focus, iris and zoom with accurate calibrated scales on each, this was a real cameraman’s camera, a delight to use compared to anything similar that had come before. As a result the EX1, EX1R and the semi shoulder version the EX3, became the industry standard for handheld production. I owned one of each and never, ever, regretted my purchases. However, there has always been one small limitation with the EX camera line. They record using XDCAM EX Mpeg 2 at 35 Mbit/s. Personally I have never had a problem with this, I think the recorded pictures are fantastic, but the EBU (European Broadcasting Union) has very specific minimum specifications for broadcast television production. There are several tiers within the specifications and the EX cameras are permitted by the EBU within tier 2J for use in news and video journalism, but for long form productions the minimum bit rate for recording is 50 Mbit/s with 4:2:2 colour space. 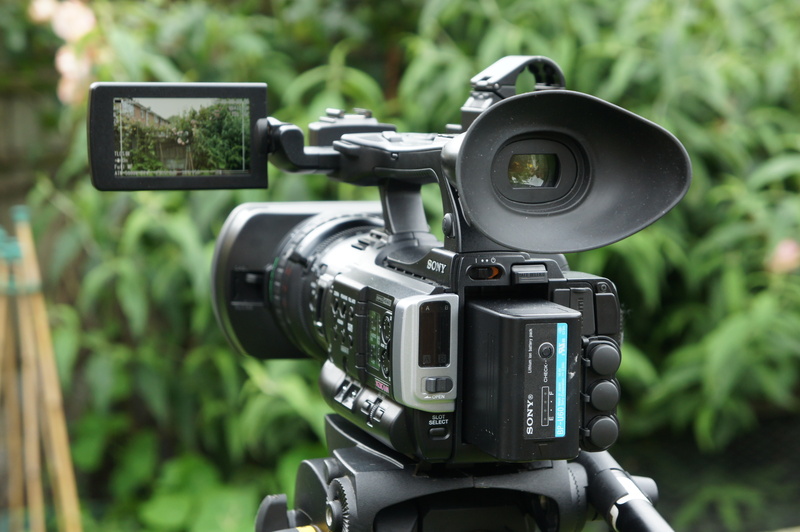 This restriction means that for long form broadcast television production in Europe you can only use an EX1 or EX3 with the use of an external recorder. 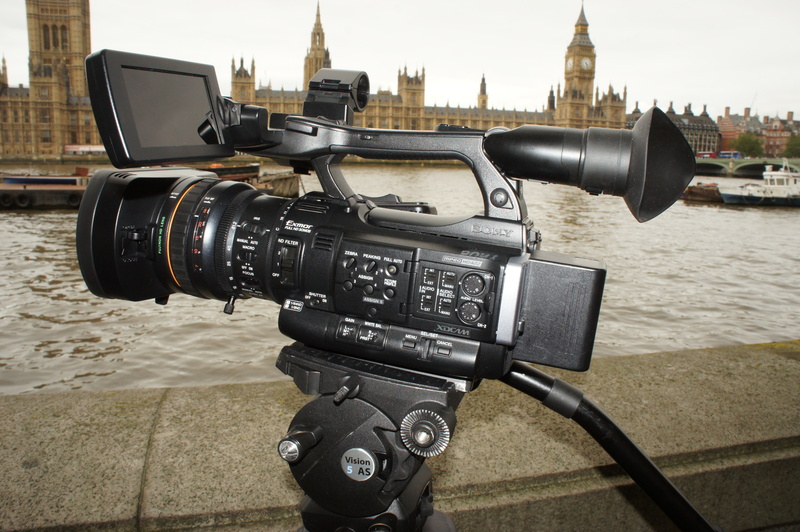 Many production companies do exactly this, an EX camcorder with a NanoFlash is one of the standard set ups approved for many broadcast programmes. In the last couple of years other manufacturers have produced handheld cameras that meet the 50 Mbit/s 4:2:2 recording minimum and some of these have been approved for use in broadcast productions. But most of these cameras don’t have the large ½” sensors of the EX cameras so often struggle in low light. 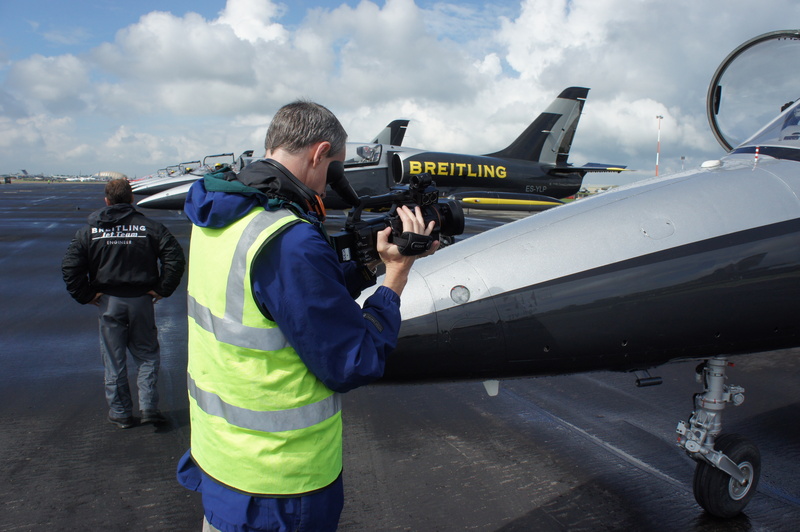 Low light performance is often critical in observational documentaries’ and many of the other types of programmes that involve the use of handheld camcorders. Now, all that’s about to change. You see, Sony have been listening and as a result of customer feedback they developed the new PMW-200 handheld camcorder. Designed to meet the needs of broadcast productions the camera records on to solid state media using 50 Mbit/s 4:2:2 XDCAM HD. This is the exact same codec as used in the highly regarded PDW-700, F800 and PMW-500 shoulder mount broadcast camcorders. As well as 50 Mbit/s 4:2:2 you can also record using the same 35 Mbit/s 4:2:0 codec as the original EX cameras as well as standard definition DV. 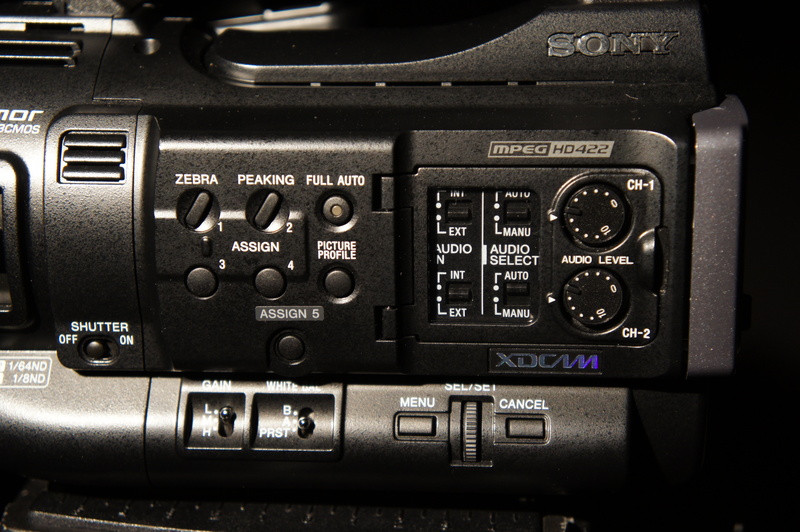 When your using the XDCAM HD422 codec you have the ability to copy your footage as video clips directly to Sony’s XDCAM optical disc system for easy and reliable long term storage and archive. A further benefit of this is that when you copy the clips to an XDCAM Professional Disc you will automatically generate proxy files on the disc, so if you already use proxies in your workflow you can now extend this to all your footage. But what about the image quality? There’s little point in having a great codec if the front end of the camera can’t deliver great pictures. 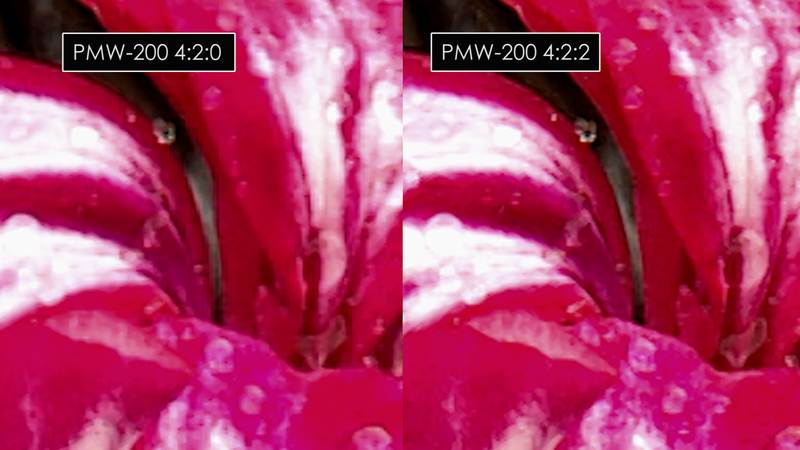 The PMW-200 uses essentially the same sensors and lens as the EX1R, so the image quality is very good. Frame grab from PMW-200. Click on the image to enlarge. 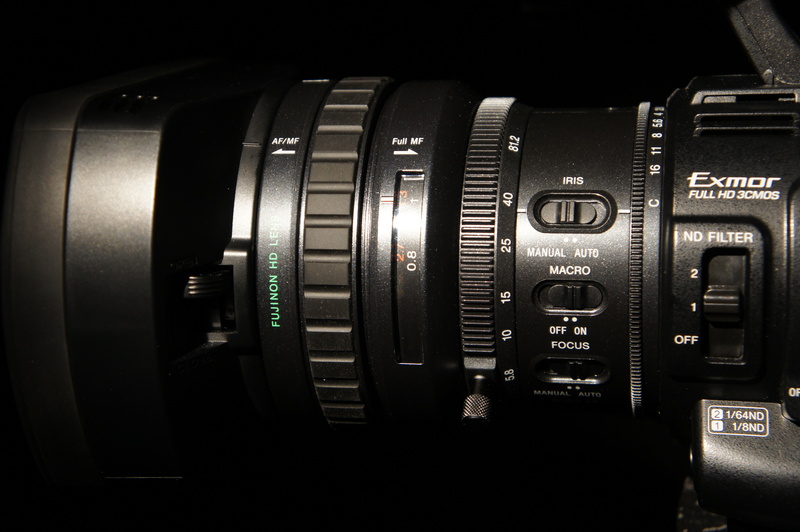 The lens is made by Fujinon and is a 14x zoom starting at 5.8mm. It has 3 rings, one each for focus, zoom and iris. Each is marked with accurate calibration marks. The focus ring slides forwards for auto focus and slides back for full manual control. In manual it behaves and feels like a true pro broadcast lens. The lens and camera front end. The zoom ring can be used manually or it can be servo driven and controlled by the main zoom rocker on the hand grip or a small zoom rocker on the handle. This zoom has an improved servo design and as a result slow zooms are a little smoother than on the EX1R. The iris ring can be switched between auto and manual and is silky smooth. Should you choose you can add an offset of up to +/- 2 stops to the auto iris to help deal with tricky lighting situations, the widest aperture is a very useful f1.9. Because this lens is very similar to the original EX lens you can use the same Sony zoom through wide angle adapter if you need extra wide shots and it has the same connector for remote zoom control. One small improvement is the lens servo motor. The PMW-200 lens has an improved servo that give better slow zoom performance. It’s not quite up to broadcast lens smoothness but it’s an improvement over the EX1R. PMW-200 lens, very similar to EX1. Between the lens and the sensors there are 2 ND filters operated by a sliding switch giving you 3 positions, clear, 1/8th (0.9 or 3 stops) and 1/64th (1.8 or 6 stops) so the camera can cope with the vast majority of lighting situations without the need for additional filtration. The 3 sensors are the same 1920×1080 ½” sensors that made the EX cameras so special. There have been some improvements to the image processing and noise reduction in the cameras electronics and as a result there is a small reduction in noise and as a result useable sensitivity. 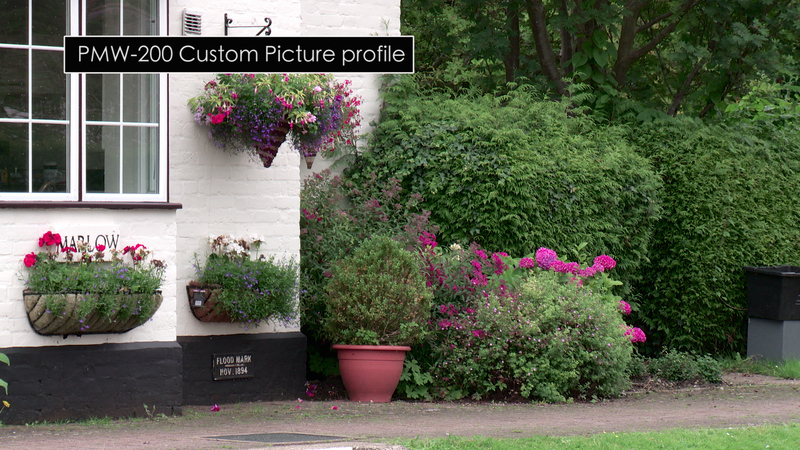 You can see the reduction in noise in my frame grabs from both a PMW-200 and EX1R. In my opinion the EX1R was the benchmark for image quality in a handheld camera and I think we are close to the limits of the sensitivity that can be achieved with current sensor technologies. So I don’t think it is a surprise that there isn’t a dramatic change. The small improvements are most welcome and I really like the images the PMW-200 produces. The pictures are rich and organic looking, they have very good dynamic range, I estimate a little over 11 stops and the noise levels are low enough to allow the judicious use of a little gain where needed. Sure there is a little more noise than you would get with a modern 2/3” or Super35mm camcorder but that’s just down to the laws of physics. Bigger sensors and bigger pixels give a better signal to noise ratio and being realistic your not going to fit 3x 2/3” sensors in a handheld camera. The half inch design of the PMW-200 is a great compromise, small enough for a compact handheld design, but big enough to give good low light performance and dynamic range. This isn’t just my opinion, this is also borne out by the EBU’s specification for long form broadcast production. The specification is know as EBU R 118 (http://tech.ebu.ch/docs/r/r118.pdf ) and for long form programmes (tier 2L) the EBU specifies a minimum of 3 full resolution half inch 1920×1080 sensors (there is an exception for 3 x 1/3” camera’s that can be shown to meet additional testing criteria) recording to a minimum of 50 Mbit/s 4:2:2 and the PMW-200 fully complies with this. Frame grab from the PMW-200. Click on the image to enlarge. Picture Profiles: As with every other XDCAM camcorder the PMW-200 gives the end user the ability customise many aspects of the images it produces. 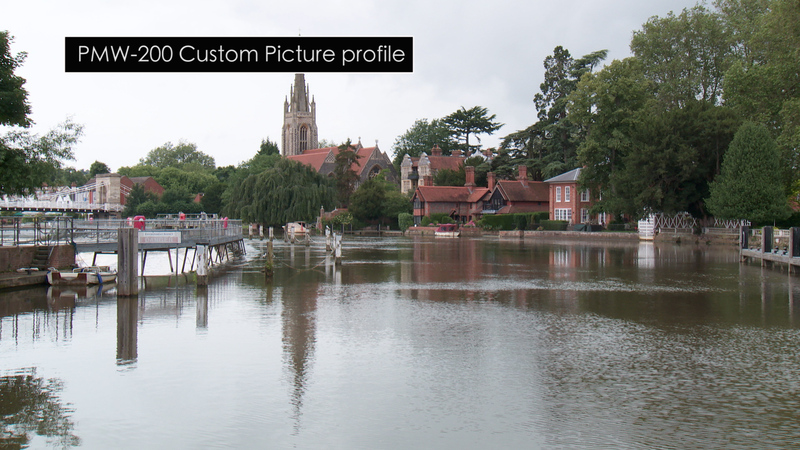 This is done through the use of the Picture Profiles menu. 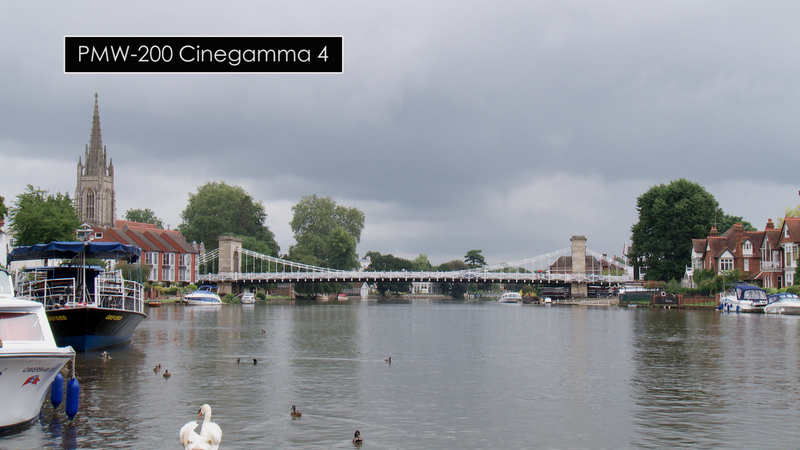 You can change the cameras gamma curves to fine tune the dynamic range and contrast in the pictures. There are 6 standard gamma curves which can be used in conjunction with either an automatic knee or manual knee as well as 4 Hypergamma curves. 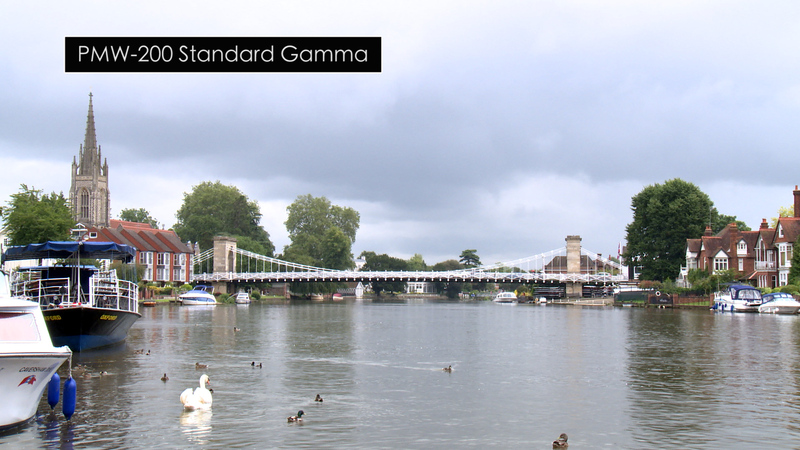 Standard gamma 5 is a REC-709 compliant gamma curve and is the default gamma. The Hypergammas are the same curves as used on the PMW-500 and PDW-700. These are very useful as they offer improved dynamic range (460%) compared to the standard gammas but more importantly they do not use conventional knee compression. The Hypergammas gently roll off highlights in a much more natural looking way than the harsh electronic looking compression that a traditional knee circuit introduces. Hypergammas 1 & 2 are broadcast safe, never recording above 100%. Hypergammas 3 & 4 have the same curves as 1 & 2 but allow the use of superwhite recording levels (109%) to give you a little more data to play with in post production. As well as gamma the picture profiles allow you to choose from 6 different preset colour matrices and allow you to modify the colour saturation and colour vectors. This makes it easy to match the PMW-200 to other cameras or to create a number of in-camera looks. Matrix 1 gives a warm look with a little extra red, 3 is a little less vibrant, 5 & 6 give deeper blues with 6 being a little less saturated than 5. If you want a sharper looking picture you can use the detail controls to boost the edge contrast enhancement. Just be aware that too much detail correction can lead to ugly black edges around objects. Reducing the detail level below -20 starts to soften the picture if you want a slightly defocused look. 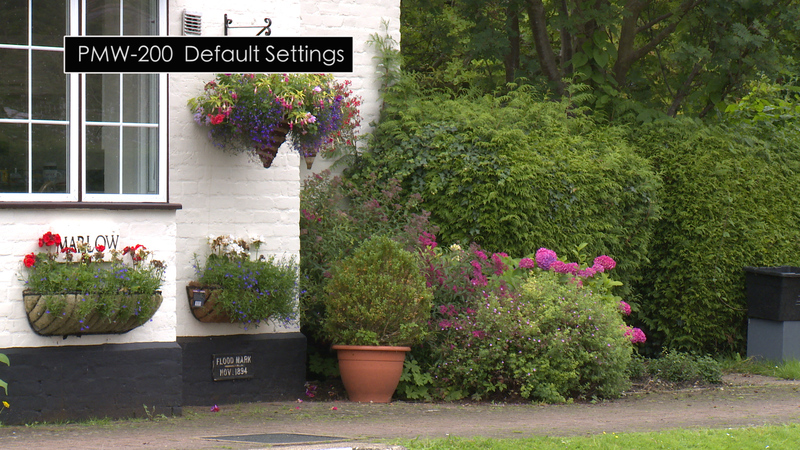 As well as the detail controls there is also a separate control for aperture correction. This is a high frequency boost that can be used to enhance subtle textures and fine details on things like fabrics. I found that by setting the detail level to -8 and aperture to +30 the camera produced pictures with a nice crispness without looking artificially enhanced. There are many other adjustments that can be made in the picture profiles including knee settings, black gamma, a multi matrix or colour correction matrix and skin tone detail settings. I urge anyone that uses one of these camera to learn about what the various settings do as the picture profiles are a great way to tailor the camera to meet your exact needs. The PMW-200’s main menu structure is again very similar to the EX cameras. It is logically laid out and easy to navigate. 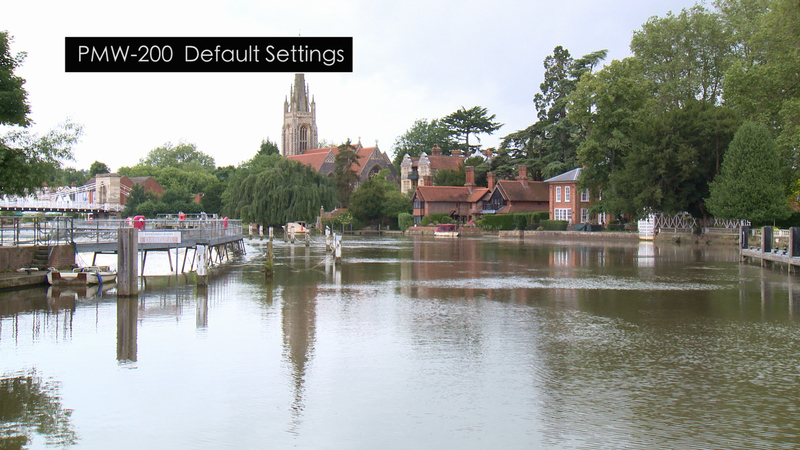 There sections for the camera settings, audio settings, outputs, monitoring, timecode and general system settings. In the camera menu you’ll find settings for the more advanced modes that the camera has, which include Interval Record for time-lapse, Frame Record for animation and stop frame filming, Picture Cache and S&Q (slow and quick) motion. The Picture Cache mode is particularly useful for capturing unexpected events. In this mode the camera continuously buffers the video from the camera sensors into an internal memory. When you press the record button recording stars immediately but in addition the (up to) 15 seconds prior to pressing the record button are also recorded. 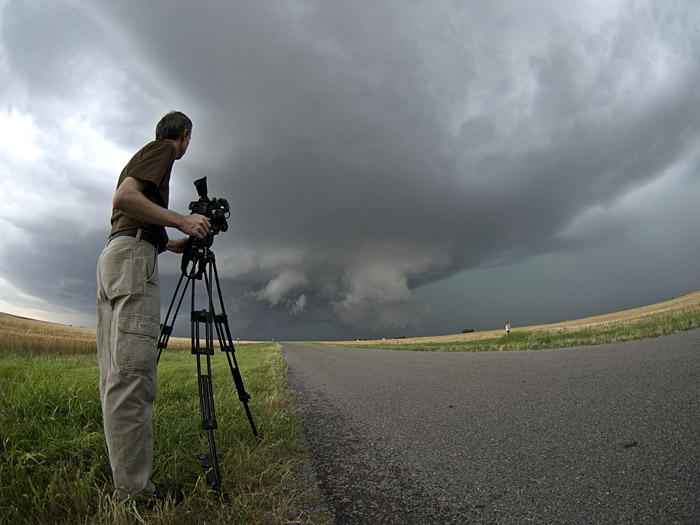 I use this mode a lot when I’m shooting thunderstorms and lightning as I can simply point the camera at the storm, wait for the lightning to strike, then press the record button. Rear view of Sony PMW-200. The interval record mode allows you to shoot great time-lapse sequences with ease. For sunsets and sunrises and other scenes where you may have a big exposure change you can also take advantage of the cameras clever TLCS (total level Control System) function. This is a sophisticated kind of auto exposure mode. I’m not normally a fan of auto exposure but TLCS allows you to set limits for the amount of automatic gain, iris, shutter speed and the response time. 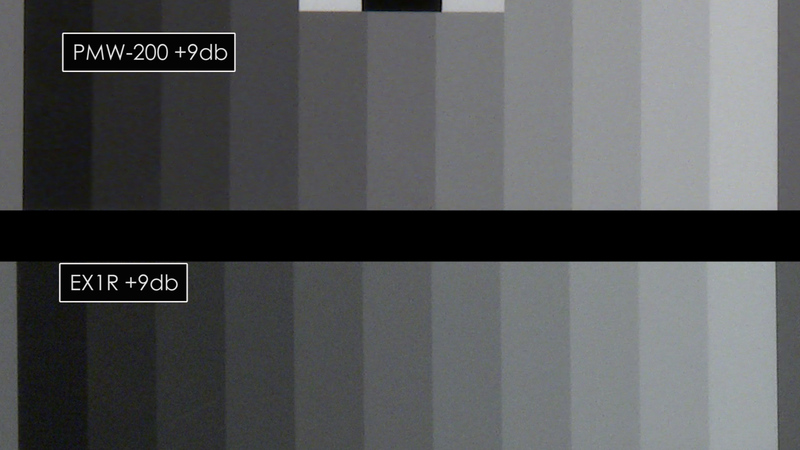 By limiting the maximum gain to around +9 db you can be sure that your pictures won’t become too grainy as the sun sets. With TLCS the camera will still be able to correctly expose while the sun is still up thanks to the auto shutter and auto iris. TLCS is a very useful tool in the PMW-200’s arsenal. Menu and playback controls on the PMW-200’s handle. With S&Q motion you can shoot at up to 50/60 frames per second (depending on region settings) at 720p for slow motion and effects shots. You can choose any speed you want from 1 fps up to the maximum in 1 frame increments. Below 25/30 fps you can use the full camera resolution of 1920×1080. Talking of frame rates, the PMW-200 can be switched between both PAL and NTSC regions. As a result it can shoot at a multitude of frame rates at full 1920 x 1080 including 23.98p, 25p, 29.97p, 50i, 60i and at 720p it can record at 50p and 60p. 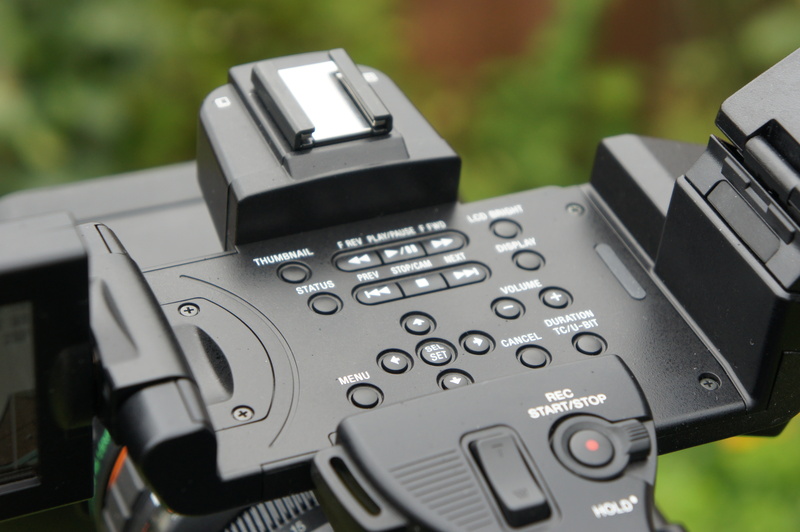 Recording Media Choices: The PMW-200 is designed to record on to SxS cards but you can also use SD cards, memory sticks and Sony’s new XQD cards via adapters. When you use the camera in any of the 4:2:2 modes the camera must format the cards using the same UDF format as the full size XDCAM optical disc cameras and XDCAM HD422 cameras. In UDF mode you can only use SxS cards. If you want to use SD cards or memory sticks then you have to use FAT formatting and this restricts you to the same 35 Mbit/s 4:2:0 recording modes as an EX camera. I strongly recommend that you use SxS cards. They are incredibly reliable and very fast. They are designed for video applications and in 5 years of using them I’ve never suffered a failure despite freezing them in ice and washing them in the washing machine (neither of which I actually recommend). You can offload media from your cards by connecting the camera to a PC using USB or by using the Sony SBAC-US10 USB card reader. If your computer has an express card slot you can insert the cards directly into the computer or if it has a Thunderbolt port you can use the Sonnet Echo Express card reader for incredibly fast transfers around 6x real time for 50 Mbit/s 4:2:2 material, even faster for 35 Mbit/s. Audio is as you would expect from any professional handheld camcorder except this one can record 4 channels of audio at the same time. 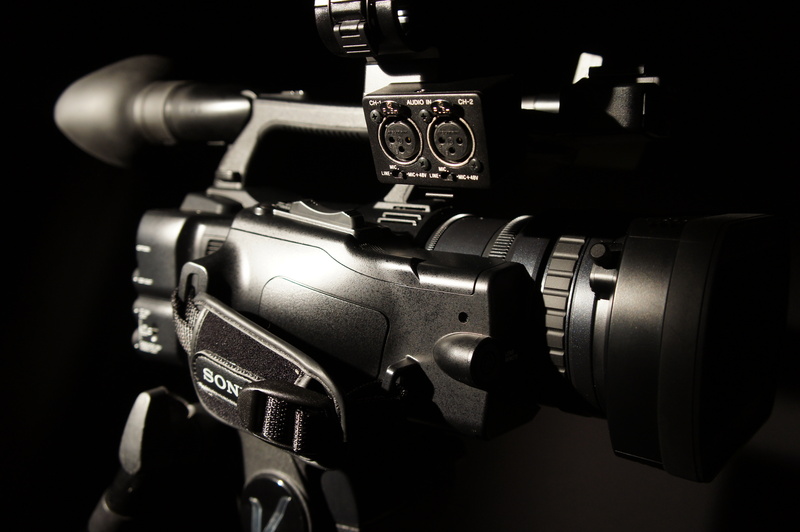 There is a built in stereo microphone at the front of the cameras handle as well as two XLR connectors for external microphones or line level inputs. The XLR’s have phantom power if you need it. It is possible to record the internal microphones with automatic gain to audio channels 3 and 4 while the external mic inputs are recorded to 1 and 2. 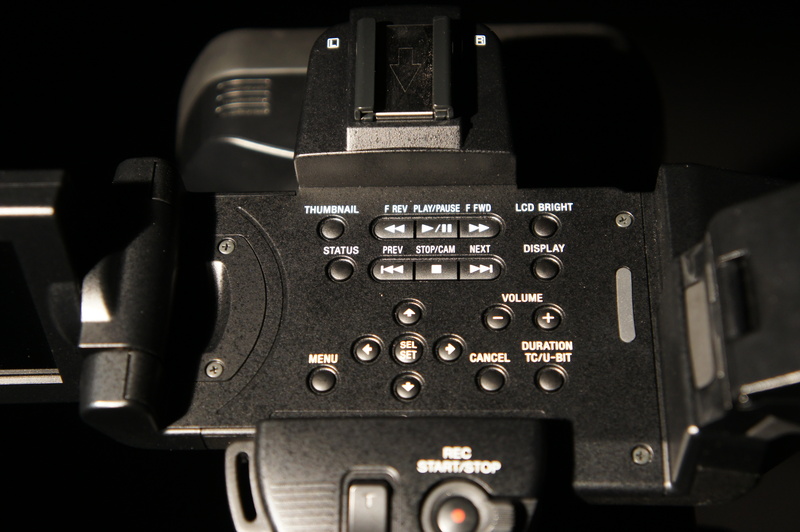 On the side of the camera there are controls for selecting the internal or external audio along with switches to move between automatic audio gain or manual gain plus a pair of knobs to set the manual gain level. A 3.5mm headphone socket is provided for monitoring, the volume for which can be adjusted using up and down buttons on the camera handle. If your using a single external audio source such as a mono microphone you can map this to both audio channels in the cameras audio menu. Above the XLR audio connectors there is a microphone holder. This is attached to the camera body via a rubber mount and looks to be a lot more robust that the mic holder on the EX cameras that did have a tendency to break off if roughly treated. New LCD design with ultra wide viewing angle. Great New LCD! The PMW-200 has both a 3.5” LCD screen and a small electronic viewfinder. The 3.5” LCD flips up and out from the top of the camera handle. This means that it can easily be seen from the left side of the camera as well as above and below the camera. In addition it can be twisted right around and laid back flat against the top of the handle or flipped up vertically. In the vertical position it can be viewed from the right side of the camera. For self shooters and one man bands this is really useful as it means you can conduct an interview from either side of the camera and still check your framing. When the screen is folded flat against the handle it keeps the camera compact and the LCD is less likely to be damaged when it’s not sticking out from the side of the camera. The LCD screen reversed and folded flat. The screen itself is bright and clear and has a remarkably wide viewing angle. Like many LCD’s the LCD on the original EX cameras only has a useable viewing angle of about 15 degrees. If you are not looking square on at most conventional LCD’s the contrast and blacks are no longer accurate and this can lead to exposure errors. 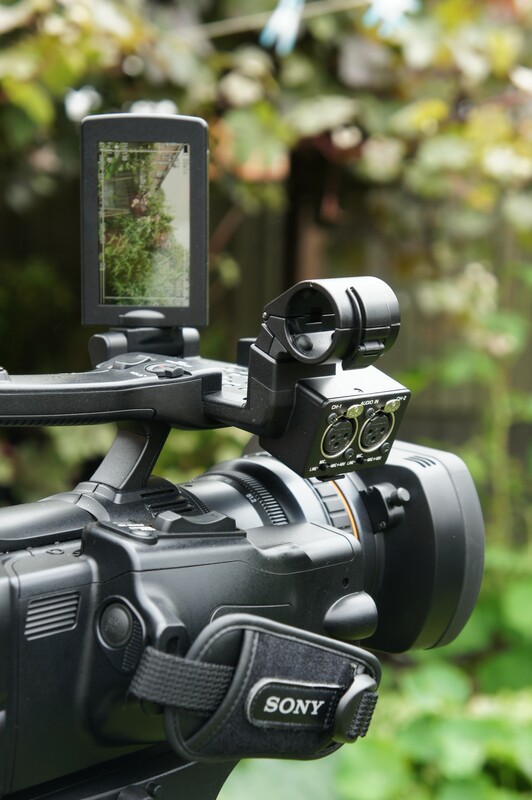 The new LCD on the PMW-200 has a viewing angle in excess of 120 degrees, you can see it from almost any angle. The contrast and brightness remains near constant even when viewed at very acute angles. This makes it much easier to use and should help reduce exposure errors. The new screen is also slightly higher resolution. One small criticism here is that on the pre-production camera that I had for review the screen was quite glossy. I hope the production screens have a less glossy finish as I prefer a matt finish. 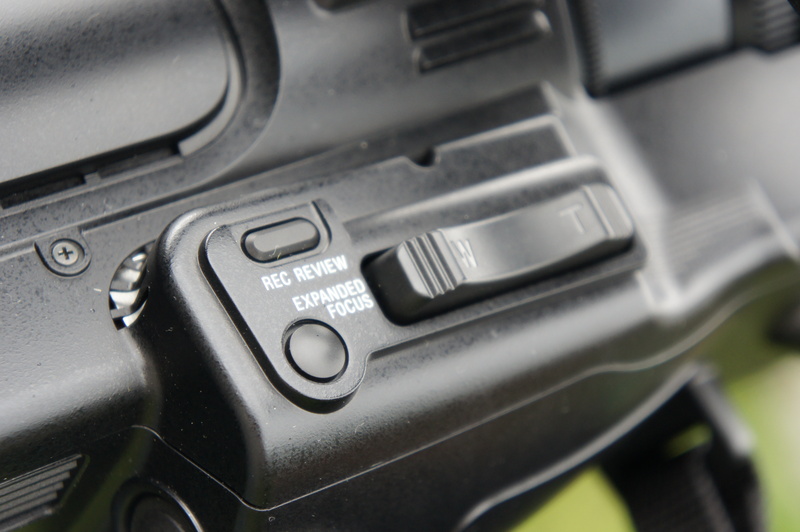 The electronic viewfinder on the back of the camera handle is the same as the one on the EX1R. I’ve seen worse, but I have also seen better. It’s adequate. Expanded Focus button on hand grip. If you make use of the cameras coloured peaking or expanded focus assistance you can focus with it, but blink rapidly and you get a rainbow effect due to the way the red green and blue pixels are displayed one after another. The expanded focus function works while recording and is easily selected thanks to a button on the hand grip just by the zoom rocker. There are buttons on the side of the camera body for zebras and focus so these can be selected quickly and easily if you need them. Rear BNC HDSDi, HDMI and other connectors. 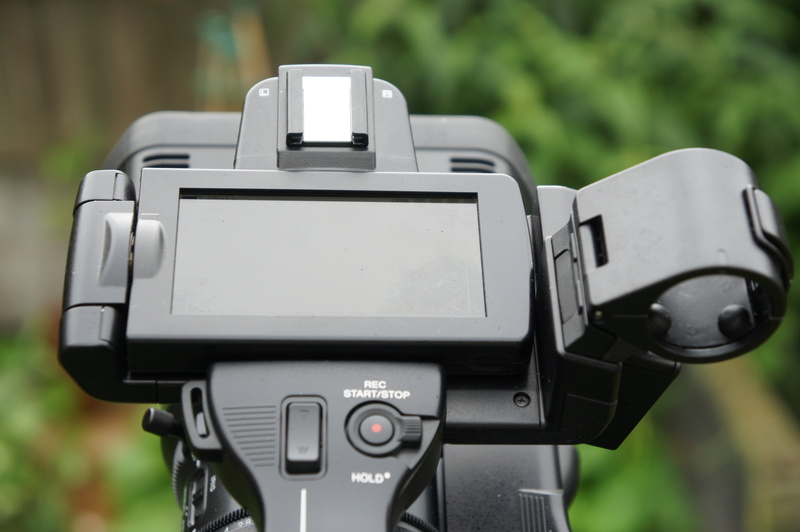 If you want to connect an external monitor or viewfinder there is a comprehensive range of input and output connections on the rear of the camera. You have HDMI and HDSDi. Both can be used at the same time should you need to. You can down convert from HD to SD while you shoot if you need to provide a standard definition external feed. If you don’t need to connect an external device you can turn off the HDMI and HDSDi outputs to save battery power. If your shooting at 23.98p (24p) you can choose whether your output is 59.94i with pull down or straight 23.98p. Just below the full size HDSDi BNC are two additional BNC connectors. The top one is for timecode and can be set to timecode in or timecode out. This is extremely useful on multi-camera shoots for synchronising the timecode on multiple cameras. Below that is a connector for Genlock In or Video Out, again an extremely useful feature that makes the PMW-200 useable in studio, multi-camera and 3D applications. 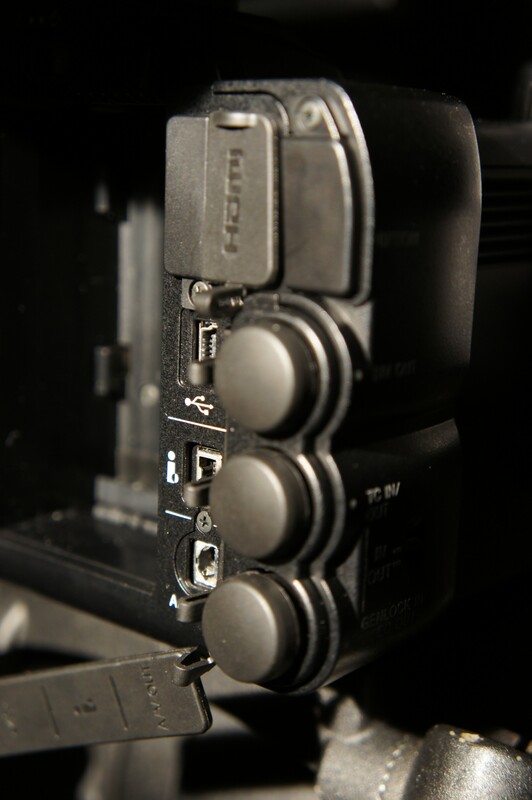 Next to the BNC connectors is a USB port for off loading footage from media in the camera. There’s an i-link connector (firewire) and AV out connector that provides stereo line level audio and composite video out. Playback controls on the handle. Playback Mode. One frustration with the EX cameras is the need to switch the camera between specific recording and playback modes. To go from camera mode to playback mode takes about 8 seconds, that’s not really that long, but if you are playing back a clip and then suddenly need to shoot something, that 8 seconds feels like forever. There is no separate playback mode with the PMW-200. You simply press the thumbnail button or play button on the handle to view your clip thumbnails or play back the last clip. If you need to record again in a hurry you simply press either of the record buttons (one on the top of the handle, one on the hand grip) and within a second the camera will start recording. This is a big improvement and very welcome. The camera switches on faster than an EX1 and there is even a fast start mode where you press the record button while turning the camera on to power up very quickly and go straight into record. Another feature coming through a firmware update and the addition of a CBK-WA01 wifi dongle will be the ability to control some of the cameras functions using an iOS or Android device. I have limited information on this but you should be able to control focus, iris, white balance and rec start/stop and maybe some other functions as well. In addition the camera should support data logging and metadata management using XM-Pilot over WiFi (CBK-WA01 required). 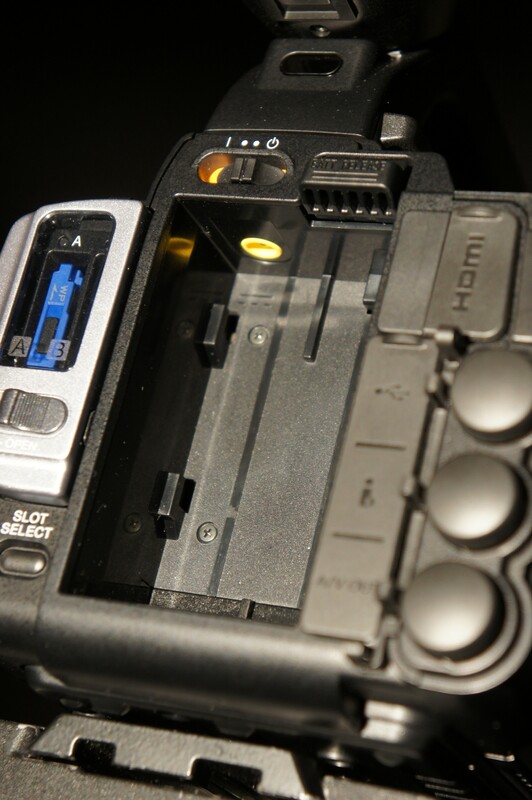 The battery compartment with recessed power connector. Power Options: The PMW-200 is a 12v camera. It uses the same BP-U30 and BP-U60 batteries as the EX1/EX3, PMW-100 and PMW-F3 cameras. It can also be powered by an external 12v power supply. The connector for external power is tucked away inside the battery compartment so you won’t be able to use any of the 3rd party batteries that use a separate cable to connect the power. It also means that you can’t run the camera off an external power supply while you hot swap the batteries. I think it’s a shame that Sony have done this. Power consumption is higher and the camera does get quite warm compared to an EX1. This I suspect is largely down to the extra processing power packed into the camera, not just for the 50Mbit/s 4:2:2 encoding but also for the improved image processing. I still got around 3 hours out of a well used BPU-60. To get rid of the extra heat the camera is covered in cooling vents. As handheld cameras like this get used outside in all kinds of weather I was a little concerned about water ingress. 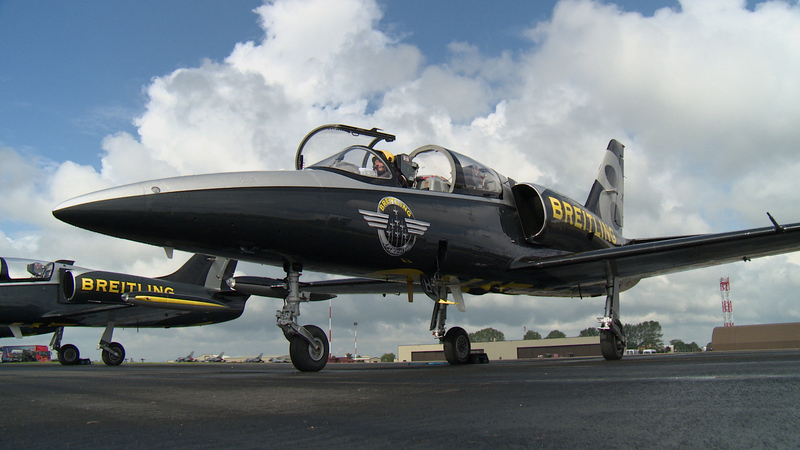 However after shooting for a weekend at the Royal International Air Tattoo in showery rain I didn’t experience any problems. The engineers at Sony tell me that there are shields inside the camera to prevent any moisture that might get in from doing any damage. As always when shooting in the rain you should really use a rain cover with any camera anyway, but we do all get caught out in a shower from time to time. 422 compared to 420 both shot with the PMW-200. Click on the image to enlarge. Conclusions: Well I got to use the PMW-200 in Singapore in bright sunshine, high heat and humidity. I also shot night time cityscapes with it. It shrugged off the heat and performed flawlessly. The low light footage looks really good. Then I spent a week with it in the UK, putting it through its paces on a couple of paying shoots for clients. 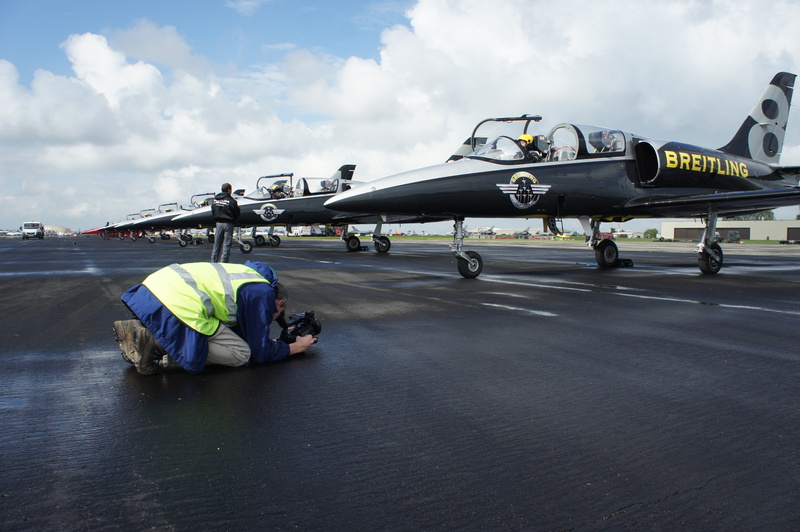 One a corporate video, the other shoot involving running around on the apron of a military airbase filming aircraft preparing for an airshow. In addition I used it to shoot the video review that accompanies this written review. At first I just saw the PMW-200 as an EX1R with the addition of 50 Mbit/s 4:2:2, which in itself is a nice improvement. But then when I started to find some of the subtle improvements like the better zoom servo, the wide LCD viewing angle, reduced picture noise and improved handling the PMW-200 really started to grow on me. It’s not significantly different from the EX1R and that’s good. 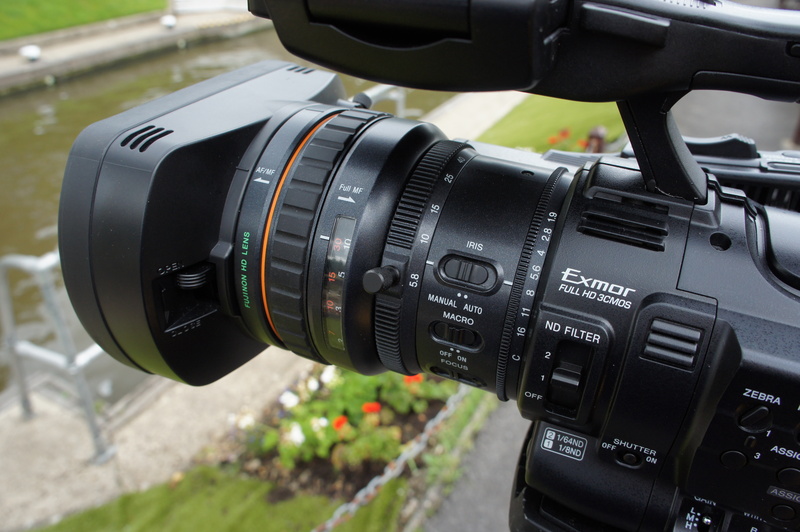 The EX1R is a great camera and the PMW-200 builds on the strengths of the EX series. I believe this camera will do extremely well. It’s just what’s needed for many broadcast productions. Best in class low light performance. Beautiful full resolution images, easy to use and an industry proven workflow that meets broadcast standards. Disclosure. I am a Sony ICE (Independent Certified Expert). I am NOT an employee of Sony, but I do work with Sony helping with training, education and events. I was paid a fee by Sony to cover the costs of shooting and editing the video and the time taken to write this review. I was not asked to write a favourable review and the reviews (seen here and on the Sony web site) were not modified, edited or changed by Sony from my original submission other than a correction to the EBU R118 specifications (added note about 1/3″ dispensation). 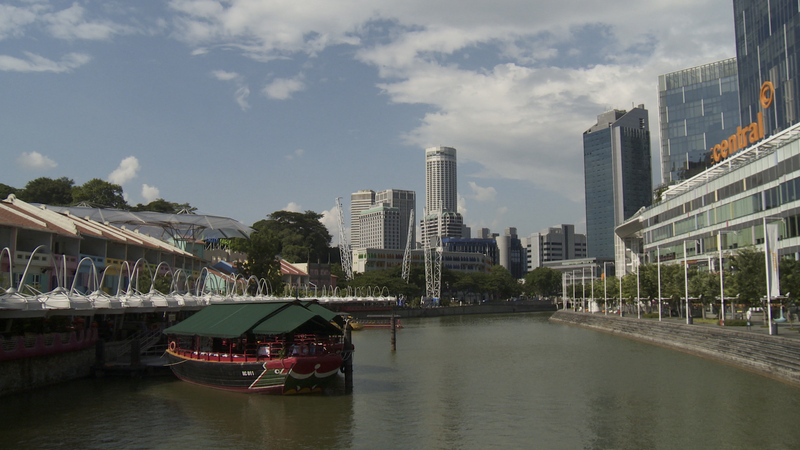 The views expressed here are my own and are based on my experience using a pre-production camera for 2 days in Singapore and 10 days in the UK.